Management legend Peter Drucker said, "Quality in a service or product is not what you put into it. It is what the client or customer gets out of it." Savvy enterprise PMO leaders are starting to catch on. Others are not. In the Project Management Institute's Pulse of the Profession 2018 report, PMI CEO Mark Langley cites among leading causes of poor project performance the "failure to bridge the gap between strategy design and delivery" and the lack of executive understanding that "strategy is delivered through projects." I would go one step further and add that there's also a lack of understanding that projects are delivered by people, many of whom are overloaded. This would explain resource issues being cited as a huge pain point in numerous organizational studies. In other words, helping the organization deliver value through better Strategy Execution. To this end, the trend is moving toward EPMOs (or Enterprise PMOs), even in smaller organizations, though a more appropriate name might be Strategy Execution Office. CHAMPIONS = Organizations with 80% or more of projects being completed on time, on budget, meeting business intent, and having high benefits realization maturity. UNDERPERFORMERS = Organizations with 60% or fewer projects being completed on time, on budget, meeting business intent, and having low benefits realization maturity. The report goes on to say that "80% of champions have a PMO and 72% indicate there is high alignment of the EPMO to organizational strategy." The report aptly defines the EPMO's role as a central function at the strategic executive level, ensuring "strategic alignment between business objectives and the projects and programs that deliver them." In this regard, it calls out the need for executives to "better recognize the full potential of how the EPMO can bridge strategy and value delivery." Note the term "value delivery." 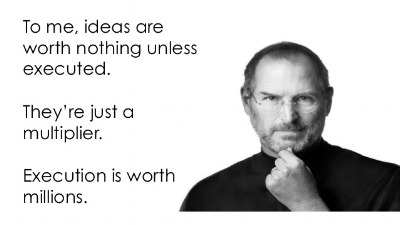 Even Steve Jobs, the master of ideas, recognized that the best visions, the best strategies, are fruitless unless the organization can execute on them. And that requires continuously aligning programs, projects and resources with business priorities and making sure the intended value is indeed being delivered. Overall, there's no doubt that, to remain vital in 2018 and beyond, a value-driven PMO can play an important role by filling the strategy-execution gap, thus ensuring programs and projects are actually delivering the intended benefits and providing value to the organization. A key part of this is fostering an ongoing process for verifying priorities and properly allocating resources to the most important work. This is best done as part of a regular cadence of portfolio review meetings. Another key, of course, is benefits realization. Together, this operationalizes value delivery. And isn't that what every organization is after? Older PostProject Communication and Management - What's in Your Toolbox?